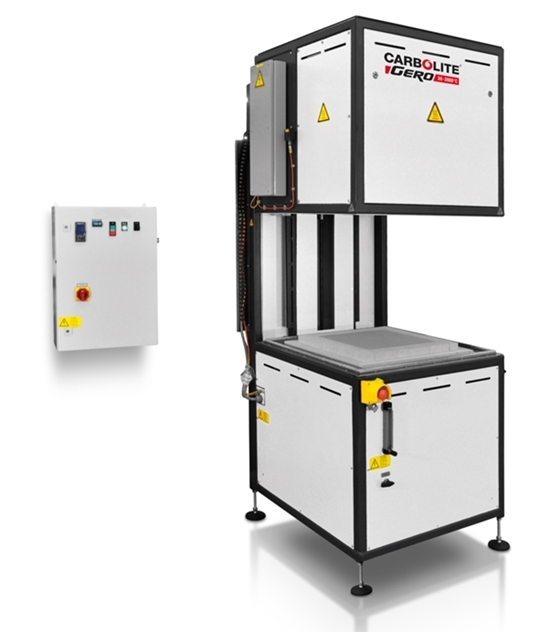 The Carbolite HB Top Hat Furnaces have an automatically operated vertically moving hood for heat treatment in air. The moving hood design allows samples to be accessed from three sides. The HB can be equipped with CrFeAl heating wires up 1300 °C or with MoSi2 heating elements for temperatures up to 1800 °C. The HB hood furnaces are available with usable volumes of 80 to 514 litres with the inner space being rectangular in design and the base plate having a convenient height of 750 mm. The hood moves up and down automatically to load and unload the sample. All debinding applications require the use of an optional afterburner. The afterburner is driven by propane gas and compressed air to burn any evaporating binder. Carbolite Gero specializes in custom designed furnaces and can also create a customised version of the HB to accommodate specific heat treatment needs. It is possible to equip a gas circulating system to improve temperature uniformity. Several sample thermocouples can be inserted into the furnace chamber to monitor and test the temperature profile. Through the use of a serial interface, the thermocouple data is logged at predefined intervals for evaluation. The furnace is operated manually with a Eurotherm controller. Other controllers are available upon request.